Soil pH is a hot topic. Here in the southeast, most soils are acidic in nature. The soil tests I’ve pulled this year have averaged from 5.8-6.5, which is on the slightly acidic side. But how do you know if you have acidic soil? Excessive Weeds. This isn’t a sure fire way to tell if you have acidic soil, but it is a POTENTIAL indicator. Some weed varieties tend to favor acidic soil. If weeds seem to be out competing your turf, this could be why. Excessive Moss. Moss tends to thrive in shady, wet conditions, so again this isn’t a sure fire way to prove acidic soil, but it can be an indicator. Non-responsive Turf. If turf shows no response to applications of fertilizer, then we are likely facing a pH issue. I know if I’m treating a lawn and I get less than expect results from fertilizer, the first thing I’m going to do is pull a soil test. Soil Sample. Soil samples should be pulled on all properties at some point. So you pulled a soil test, and your pH is 5.5. Fescue tends to prefer a pH in the 6ish zone, so I’d recommend working on a way to adjust soil pH. But how? There are a couple of ways to get the job done, but it comes down to how quickly you need the adjustment to take place, and how long would you like the adjustment to last. Dolomitic Lime is a great long term solution – with emphasis on the long term. Dolomitic lime will take months to adjust soil pH. Dolomitic lime is an easy way to get the job done. Because it’s pelletized you can simply throw it in your spreader, adjust to your desired setting, and spread away. 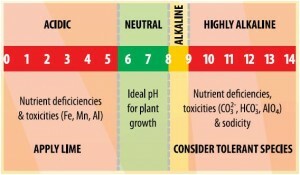 Rarely do I ONLY apply dolomitic lime when facing a serious pH issue because there are other fast acting products. Calcium Nitrate is my favorite go to product for immediate pH action. Calcium nitrate is usually labelled a 6-0-0 micronutrient fertilizer. It has 6% nitrogen in the formulation so it will give you a small boost of color. Best of all, it very quickly and significantly can adjust soil pH. Is acidic soil affecting your lawn? Pull a soil sample and consider an application of dolomitic lime and calcium nitrate to correct your issue.